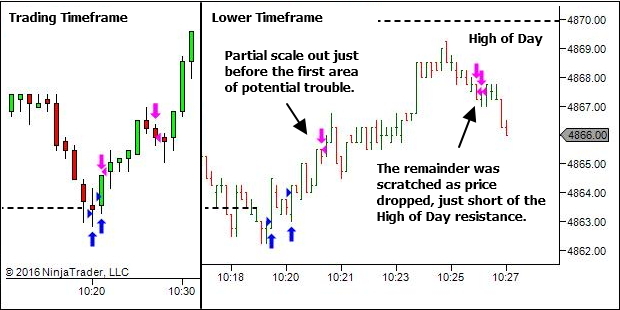 Here's an image from the article, showing the entry SHORT against a single wide-range bullish candle. Review the original article if you want to see the context behind the trade. For now though, I want to discuss some concerns that a few people expressed. Because I imagine there are a whole lot more who felt the same thing. The feedback was quite varied in nature. A couple of people really "got it". 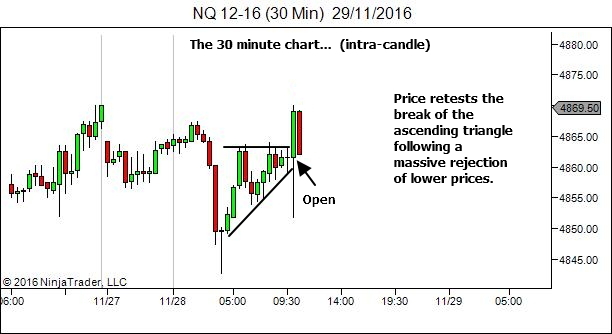 They understood that while the candle appears to show great bullish strength, the internal movement didn't necessarily suggest that was the case. "I don't understand, how you are comfortable to take up the 2nd setup"
It is scary if all you see is the strong bullish candle. It's in a good contextual location. It has a good R:R. And I don't just place a limit order and let it get overrun. I'm watching and waiting to see some inability to continue further before placing the entry order. These are some of the toughest trades that I do take (from a psychological perspective). They're simple in concept. But they are not easy. They're not for new traders. If you're not comfortable with them, don't take them. Stick to the easier ones. But learn from them. Maybe take note of them when you do see them and then study them post-session. As you gain experience it might be something you one day add to your game plan. Again… let me reinforce the last point. You don't have to trade these if your skill level is not ready for them. There are much easier setups available. I went looking for something similar over the last fortnight, so that we could work through another example. But there hasn't really been a great example since then. But then I thought maybe this one will help. The context is different. But the fear is much the same. 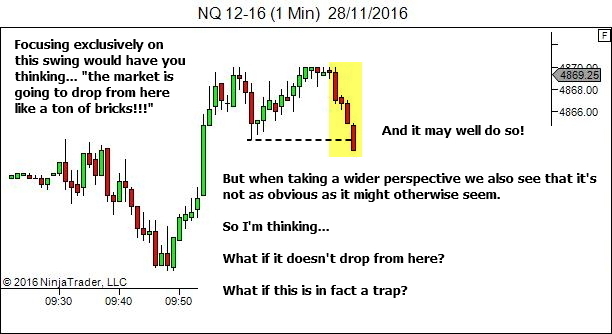 Whenever I've posted these type of trades in the past I tend to get much the same feedback – "There is no way you can enter here! ", "You're stepping in front of a freight train! ", "It's too scary! ", "But what if it fails?" 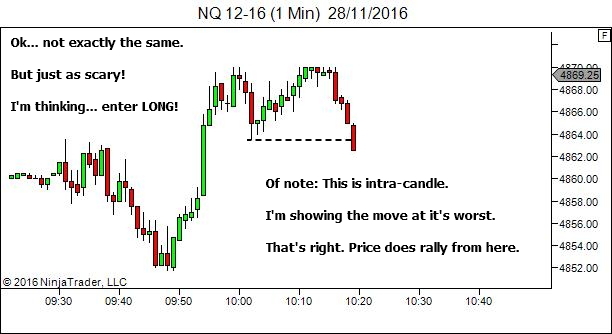 One other thing I like about this example is that it slows the process down, with the end of the pullback occurring over 3 candles. This might make things a little easier to see. As we discussed here in these articles, until I see evidence of the break lower holding these levels, I'm expecting a break like this to fail. It's a simple shift in mindset that makes these traps easier to enter. Of course, it's never completely comfortable. The move down to the level does display some bearish strength. And as readers of my ebook series will note, I'm not a fan of fading strength. 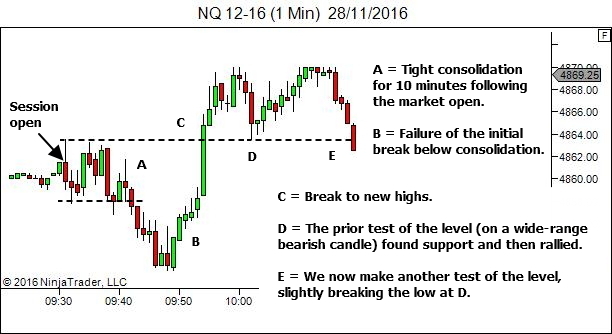 But in the case of a break of a level like this, at the end of a long move, it's the behaviour of price AFTER THE BREAK that really matters. 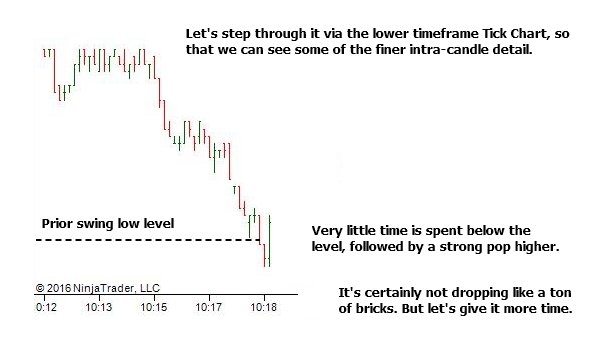 Will price show continued bearish strength and drop like a ton of bricks? Or will it stall and then break back higher? 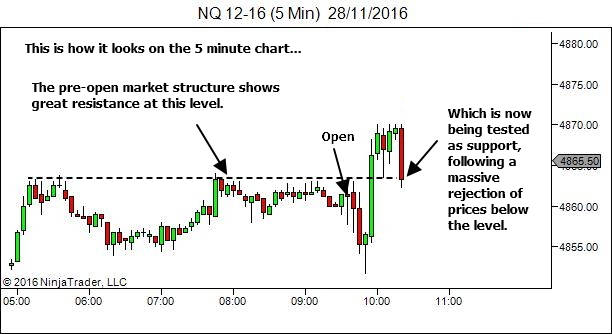 As I noted earlier, I do NOT just place a limit order in a situation such as this and hope that it all works out ok. I watch. I wait. And if I see evidence that the selling is perhaps all done, only then will I consider entry. Let's move forward and see what happens. This applied with the trade two weeks ago. And it applied with today's trade. This is what gives me confidence to enter. So what? It's one trade. If it loses, I'll keep the loss small. This is not a game of certainty. The market environment is uncertain. Some trades will win. Some will lose. 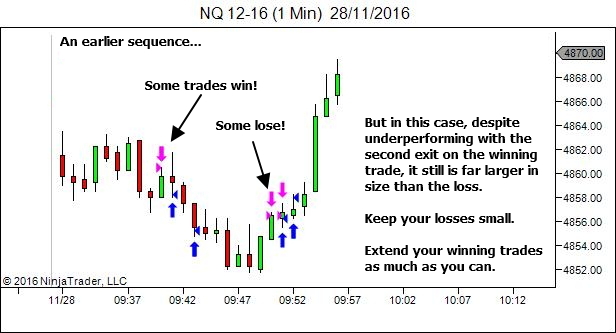 Work to keep the average loss smaller than the average win. Yes, it's hard to enter against a break. Or against a strong single candle pullback. If you're not comfortable with this, stand aside and wait for something easier. But observe them. Make decisions as you watch them live. And take notes. Study them post-session. As you gain confidence, you might want to consider sim trading a few. And eventually trying them live (small size). But if it's in a good contextual location. And if the R:R is acceptable. Then watch. And wait. 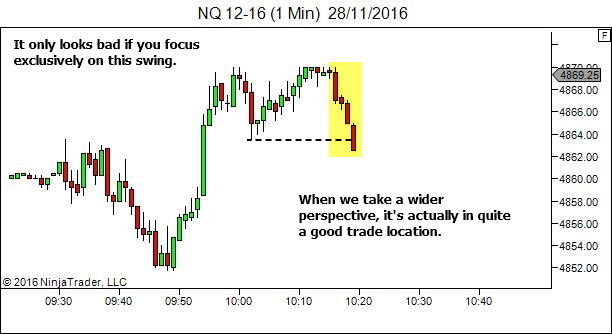 And if price shows that it's given all it's got, and appears unable to move any further in the pullback direction, then take the trade. Keep the losses tight. And if it wins, then squeeze it for all the profits you can get. Those who contact me expressing fear of fading what appears to be a strong candle, or a break of a level, have clearly not yet developed this level of skill and/or knowledge. And likely have not yet truly understood the probabilistic nature of the game and the fact that edge plays out over a larger sample of trades. Hi Mr Beggs, thank you for the article! Great source of knowledge! Can we consider this PA as a 3-swing retrace in an uptrend (with possible transformation into range)? 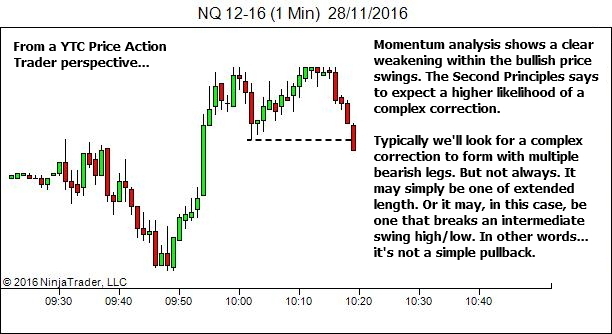 Technically to call it a a 3-swing retrace I’d require point 2 to be below the original swing high. Otherwise it’s really a double-top formation. But if you wanted to look at it this way I’d have no problems with that at all. 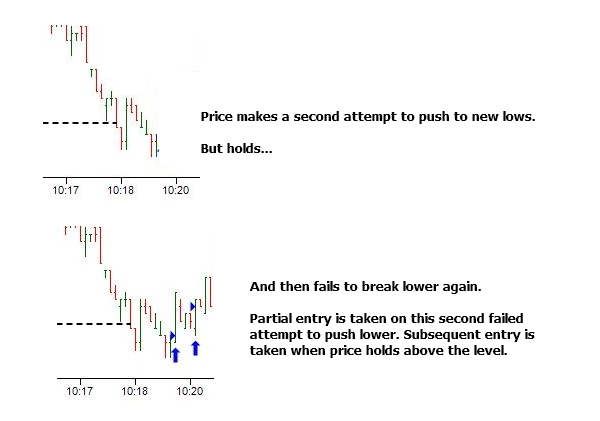 In both cases, our bias is still LONG and we’re looking for some kind of pullback entry. I was well aware though of the fact that we were close to having transformation into a range. This is part of the reason for my underperformance with the second part of the exit. 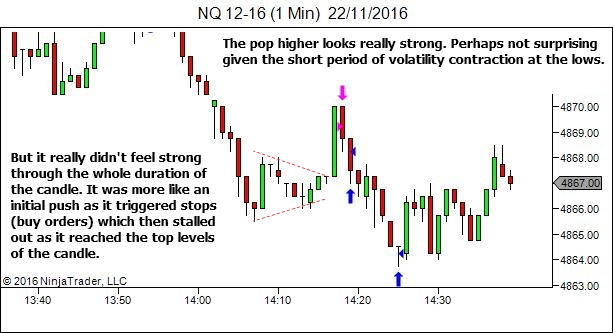 I held part two in the hope that it would break to new highs, but once the top was in I scratched. It then went higher without me. I’ve looked at this a dozen or more times since. I’m still happy with my exit decision, despite “what could have been”. Makes sense to me! 🙂 Thanks Joel. You’re absolutely right. Anyone who is fearful when faced with large bars does not fully understand orderflow. 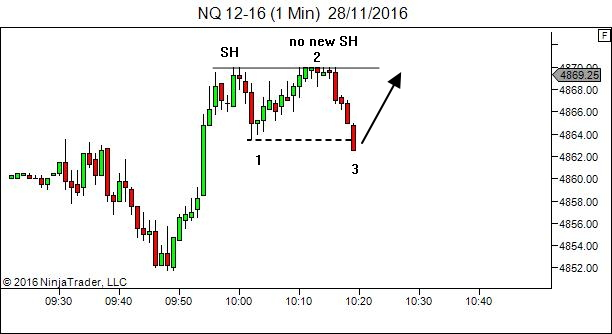 More study is required in this area – market microstructure, auction market theory. and lots of screen time and thought about “what is happening… and why”!